Upper Svaneti is a mountainous region known for its unique 3- to 5-storeyed tower houses dating from the Middle Ages. The region is inhabited by the Svans, an ethnographic group of the Georgian people. Their villages have retained their medieval appearance and traditional land-use. The villages also hold small Georgian Orthodox churches and various fortified buildings. The core zone is limited to the village of Chazhashi in Ushguli community. 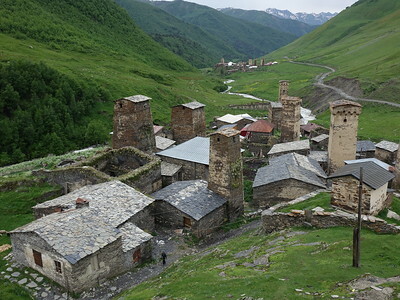 Upper Svaneti is among the most remote WHS in Europe, and one that has been on my travel wish list for long. It was a fairly dangerous place until 2003, “when robbing the foreign visitors were almost a daily thing”. Since then it has arrived slowly on the beaten tourist track. The road to get there is steadily improving as well: it took me 2.5 hours from Zugdidi to Mestia, and another 2 hours to cover the final 44km from Mestia to the Ushguli valley with the WHS (full-size marshrutka’s still take longer than the shared jeep-taxi’s which I took). 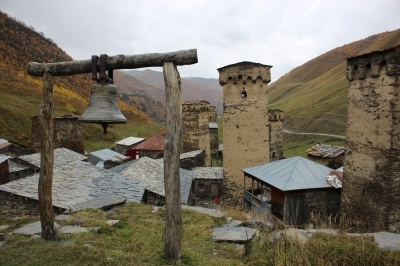 I stayed for 3 nights in the Svaneti capital of Mestia, a lively town similar to a ski resort. At the central square of Mestia, jeeps and minibuses congregate daily to take tourists on a trip to Ushguli. The asking price for a spot in a jeep for a return trip is 50 lari (17 EUR), a private car costs 200 lari. I did not want to wait for a jeep to fill up, so I splurged on the private option. The road still needs a 4WD because of the many potholes that fill up with rain water, and the muddy state of it all. We did encounter some brave cycling tourists along the way however. The surrounding landscape is just beautiful: narrow, green valleys with high peaks on either side which still hold a lot of snow. This area has the highest mountains in Georgia, including the Shchara (5201 meters). Along the way we already passed many villages with the characteristic Svaneti tower houses, also Mestia still has a lot of them. Despite its grand name, the Upper Svaneti WHS has a ridiculously small core zone. In the Ushguli valley there are 4 villages or hamlets dominated by tower houses, but of those only Chazhashi has been inscribed as it was already under some form of protection. According to the UNESCO description, it “has preserved more than 200 medieval tower houses, churches and castles.“ Well – this is really not true! As you can see from my second photo, it has only some 25 buildings (28 people live there according to the 2014 census). In Chazhashi the tower houses are close together, and no modern buildings have been constructed among them. The streets are unpaved, and slippery due to a combination of mud and cow manure. The special feature of the tower houses is that the upper floors were used as watchtowers, and on the bottom floor the people and their animals lived together. These animals are still trampling through the streets: pigs, dogs, cows. Young ‘cowboys’ tend to the cows on horseback. On the other side of the river there are 2 more villages: Chvibiani and Zhibiani. These are more picturesque than Chazhashi at first glance: especially because they have the snowy white mountains as their backdrop. But there are more modern buildings standing between the residential towers here. These villages hold two tiny churches and a museum, but I found everything closed on a Monday. Finally my driver pointed me to a path uphill. Here you end up at the remains of the Tower of Queen Tamar. This supposedly was the place where the population gathered during the Middle Ages to discuss the battle plans. Here the fortress walls were once the strongest, but in the 1930s much was destroyed by the Soviets. Now it is mainly a beautiful viewpoint over the villages and their towers. A trip to the core zone should be complemented by a visit to the modern Svaneti museum in Mestia and a look into the interior of a Svaneti tower house. The museum’s highlight is a room full of icons, taken from the villages around Mestia. They have been painted in the naïve Svan-style. In Mestia as well there are 2 tower houses open to visitors. I visited the Mikhail Khergiani house, a tribute to a local mountain climber. In its main room on the first floor it can be seen how animals and humans shared the living spaces, to keep warm during the very cold winter nights. Via two ladders I climbed the tower itself – only at the top there are openings to get a 360 degree view of the surroundings. When I first read about visiting Upper Svaneti about 15 year ago, travel guidebooks were advising not to get there on your own, because of a risk of kidnapping and theft. How things have changed now ! 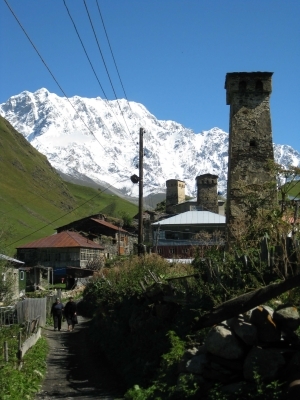 Visiting Upper Svaneti is still an experience. First thing is to get to the town of Mestia. It is a 8 hours drive from Tbilissi. The road in the moutains is in quite good condition (be careful however, because of a few rough stretches). The scenary is wonderful with views on 5000 meters high peaks. On the way, stop at Enguri dam, as Georgian authorities are thinking od adding this hydro-electric complex on the TL. There are many collective taxis (marutchka) getting to Mestia, often changing in Zugdidi, the town at the feet of the mountains. Alternatively you can get a plane from Tbilissi to Mestia, but Mestia airport is very small and highly subject to bad weather. Flights are often cancelled at the last minute. In Mestia, there are plenty of hotels and guesthouse. I would recommand Nino Tatiani’s guesthouse, with a very friendly atmosphere and very nice buffet meals. In the central place of Mestia is Leila’s restaurant. It has daily shows of traditional polyphonic song performed (which are on the UNESCO immaterial list). The road from Mestia to Ushguli is rather rough. It is recommanded to take a marusutchka or a private car to drive this 50 km long road, which will take 2 to 3 hours. Most hotels or guesthouse in Mestia can organize the transport (Nino organized for me to join other guests in a common private rental car). The road is sometimes very rough, but if you have a 4x4 car, it would not be too difficult to get there on your own. Ushguli is a community of several isolated medieval villages, high in the mountains, at 2200 meter. Only one village, Chazhashi, is inscribed as WHS. This particular village is the most authentic, with some 20 medieval tower houses. Some are in a very bad state of conservation, while other have been turned into museums. Walking around this village is very atmospheric. People still live in the village, and livestock are wandering around. Most private rental car would leave you 3 to 4 hours to wander around Ushguli. The driver would usually drop you off at Lamaria church complex, on a hill above all the villages. It should not to be missed, even if not part of the WHS. There is very nice views toward the moutains peaks (over 5200 meters high) and the glaciers from here. Then you can walk down the hill, crossing Chvibiani village toward Chazhashi. Some small museums, guesthouses and cafe on the way. If you have time, there is a small walk to Murkmeli village. It is also possible to hike to Ushguli, with a five-days trek from Mestia. In my opinion, it is very worth the long trip to get to Ushguli. I was disappointed by the small scale on this WHS, inluding only one of the village, and I would have liked it to include all the villages and the mountains surrounding them. I'm little surprised that Upper Svaneti is one of the least visited sites in Europe on this website. I'm surprised because it is not anymore these days hard place to visit. The WHS consists of small community of Ushguli which is made up from 4 very small villages located right next to each other. 3 of these villages with surrounding landscape form the buffer zone and the core zone is the village of Chazhashi. Chazhashi is the only village which has solely original stone houses. However most of the houses have been abandoned and the roofs have collapsed. The village includes the local museum. The core zone also includes small hill with remains of one Svan tower and church from old fortress. While traveling around Svaneti region you will already see many Svan towers but in Ushguli every house has them which gives this town an extra charm. However, the crown jewel of this place is the Shkhara mountain that towers over the landscape. 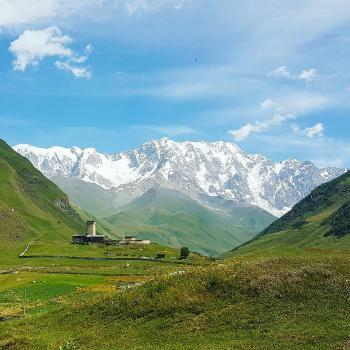 It is the 3rd highest peak of Caucasus mountains, peaking at 5193 metres! Small Lamaria Church at the edge of Ushguli offers great photo opportunities against the mountain backdrop. The whole community is highly photogenic but electric wiring and some modern constructions ruin the authentic experience a little bit. There was even construction of new modern hotel going on! But in the end Ushguli was my highlight in Georgia and definitely the most interesting WHS in the country! As I said already getting to Ushguli is easy. From Mestia you can take one of the marshrutkas that leave in the morning towards Ushguli or rent private car with driver if you're a group. The marshrutka ride takes about 3-4 hours and you get same amount of time to explore the villages. If you want to spend the night in Ushguli, there are many guest houses offering accommodation. Hiking from Mestia to Ushguli will take 4 days but on the way you will get to enjoy stunning landscapes and charming small villages. Svaneti is an absolute must! It offers some of the most spectacular and dramatic landscapes imaginable - together with a mysterious and unique culture. I highly recommend a visit to Ushguli, probably Europe's highest village (take warm clothing). It feels like a Caucasian version of Middle Earth. Only a small part of the village, called Chazhashi, is actually part of the WH list but the whole area is breathtakingly beautiful and historically interesting. Unfortunately, as of 2013, there are no scheduled flights to/from Mestia! Except from expensive charter flights (in Cessna, from Natakhtari Airfield north of Tbilisi), the only way of public transport is by minibus. The road between Zugdidi and Mestia is in good condition, Mestia-Ushguli is being upgraded these days. However, travel time is still very long and may require transfer: Tbilisi-Mestia approx. 10-12 hours by minibus, Kutaisi-Mestia 5-6 hours, Zugdidi-Mestia 3-4 hours; Mestia-Ushguli was a whopping 3 hours for 48 km in 2013. I have travelled lots of places around the world but i have never seen something such a beatiful as SVANETI. honestly, I can say that this is the Worlds Most Beatiful part. GO to Svaneti!! !